Principles and best practices from visual perception, graphic design, web usability, photography, etc. which researchers will be able to use for creating their own research figures. Combining colors and pairing fonts seem very difficult, however, with several free online tools and some key principles, researchers will be able to create their figures and charts in harmonious colors and easy to read fonts. Grant proposals are read by busy evaluators who don’t always read every word. We discuss some simple approaches that will help you emphasize the main messages of your project and make them easy to understand. One of the goals of attending conferences is meeting people that share interest in your work. We discuss principles of poster design that will draw interested audience to talk to you. 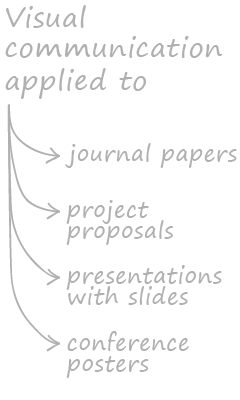 Slides are not the presentation – you are the presentation. We will discuss how slides can be used to amplify your messages and key design principles to make them good looking but not distracting. Before preparing figures for a journal paper, a researcher should read the Guide for authors. We will discuss how to extract the crucial information from the guide and use them in our graphic software to make all figures of a paper good looking and consistent. Vector, raster, lossless, lossy, PNG, TIFF, GIF, PDF, JPEG, AI, PSD etc. When to use which image file-type and which software to edit them with. The content is complementary to what is usually taught in graduate courses. We focus on the lessons researchers are supposed to ‘just pick up’ on their own and present them in a distilled form that is easy to grasp, hands on, and the participants will be able to apply to their publications right away. What’s the problem and how we help solve it? The information seeking behavior of scientists has been moving online in the last decade. Recent surveys show that already approximately 9 out of 10 life science researchers use internet search engines for their literature survey. If you are a scientist, this means that interested readers will most probably first encounter your research publications online. Now this is a paradigm that most scientists have yet to embrace. Instead of paper magazine tables of contents, your papers appear in results of a web search or some other database engine. Potential readers skim the titles in order of priority as they are served, and then skim only a minority of papers, their attention mostly focused at images and other graphics. While a growing number of universities provide early stage researchers with some sort of formal training in scientific writing, very few discuss topics from visual communication, which are nowadays gaining in importance. As there is no formal training, researchers are supposed to ‘just pick them up’ on their own, which is very unfortunate. Such pursuit requires interest, motivation, a lot of individual effort, and is thus seldom pursued. In many cases, the outlook of your scientific papers contributes to the level of credibility the reader assigns to your findings. This is not only due to some sort of vanity. Well designed figures help the reader understand your findings effortlessly and in less time, instead of being irritated by having to decipher the non-clear graphics. I have prepared these courses because it is something I would have benefited from tremendously when I started my research. You could read a huge stack of books and papers, but fortunately I have done that for you, and distilled the content into the form of Seyens courses.